For some it’s a concrete monstrosity, for others it’s just a thing of beauty – but for most it’s barely noticed as they make their daily commute. 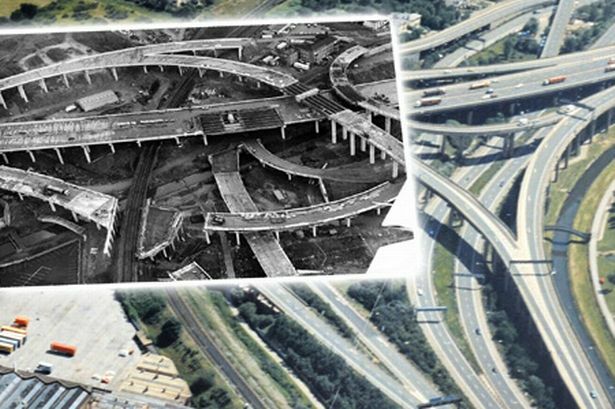 But next week Birmingham’s famous Spaghetti Junction turns 40 and to mark the occasion unseen pictures of the roadway being constructed all those years ago have been revealed. The junction was 11 years in the planning and construction involved 13,000 tonnes of steel reinforcement and 175,000 cubic yards of concrete. The 18 roads, including two-and-a-half miles of slip roads, are supported by 559 concrete columns, the tallest of which is higher than five-and-a-half double decker buses. It cost £10.8 million to build at the time and required the demolition of 160 houses, a block of luxury flats, a factory, a bank, a pub and public toilet to make way for it. Hundreds more homes near the route were given double glazing to shield against traffic noise. In its opening week, newspapers carried a series of daily pull-out-and-keep sections with maps and diagrams, fearing drivers would be dangerously confused by the various slip roads, entries and exists. On May 23, 1972, Birmingham chemist and president of the city-based British Magical Society, Tony Shelley, was allowed to drive through the junction blindfolded in an open-top car accompanied by fellow conjurer John Metcalfe and a reporter. With cotton wool taped over his eyes and his head covered by a black hood, the late master magician sailed through Spaghetti Junction at speeds of up to 35mph. Tory transport minister Peter Walker cut the tape to officially open the road the next day. Cars had been queuing for hours before the ceremony to be among the first up the ramps and, due to final safety checks, had to wait longer still before finally being allowed on. Mr Walker said: “We are opening the motorway hub of Britain,” and, with that, the first direct road link between the south east and north west of England was open. When it opened, Spaghetti Junction carried only 40,000 vehicles a day. Today the figure is thought to be five times that. An accident, or repair work, can cause massive tailbacks within seconds. But, from the police’s point of view, the junction’s 18 roads are less trouble than most as there are comparatively few accidents on the interchange. However, the heavy load of cars, coaches and juggernauts pounding the concrete surface each day means the pillars and posts take much more punishment than they were originally designed for. Reinforcement works have been ongoing since last summer and a new reinforced concrete support created under one of the bridges. The works are expected to be completed in September. The famous junction got its name when Birmingham Post & Mail journalist Roy Smith said it looked “like a cross between a plate of spaghetti and an unsuccessful attempt at a Staffordshire knot”. A sub editor shortened that to “Spaghetti Junction” in the headline – and a legend was born. Despite the efforts of officials at the Department of the Environment, they could not stop people calling it Spaghetti Junction after it was opened on May 24, 1972. Now Spaghetti Junction is known all over the world.